The two spacecraft are planned to be launched in 2020 on two separate launch vehicles from different launch sites. 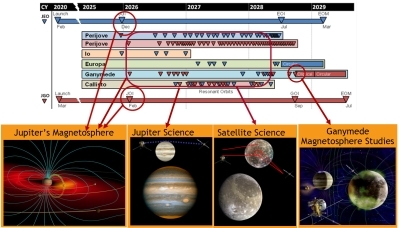 They will reach the Jupiter system in 2026 and spend at least three years conducting observations of the Jovian atmosphere, magnetosphere, moons and rings. The baseline launcher for JGO is an Ariane-5 and the baseline launcher for JEO is an Atlas V 551. After launch, JGO will use a ballistic trajectory with Venus-Earth-Earth gravity assist manoeuvres, to reach Jupiter. Jupiter Orbit Insertion (JOI) will mark the start of an 11 month Jupiter science phase followed by a 13 month Callisto science phase with Ganymede Orbit Insertion (GOI) to follow in 2028. At Ganymede, the combined elliptical and circular orbit science phases will last up to 15 months. JGO will ultimately perform a controlled impact on the surface of Ganymede before running out of orbit maintenance fuel. The figure below shows the timeline of the mission in which the JGO timeline and flybys are shown in red and those for JEO in blue. Different phases of the mission provide a variety of observation opportunities (see the table below for some examples). The scientific focus of the mission will evolve from the study of the Jovian atmosphere and magnetosphere in the Jupiter orbit phase, through the glimpses of Callisto during flybys, to detailed investigation of Ganymede, its magnetosphere and exosphere, and their interactions with the Jovian environment. Monitoring of the Jovian atmosphere, its structure, composition, and dynamics. Characterization of the Jovian magnetosphere as a fast magnetic rotator and giant accelerator and its interaction with Ganymede magnetic field in flybys. Study of Io's dynamical processes. Characterize the Callisto internal structure, surface and exospehere. Study Callisto as witness of the early Jovian system. Understand the formation of surface features and search for past and present activity. Determine global composition, distribution and evolution of surface materials. Characterize the local plasma environment and its interactions with Jovian magnetosphere. Characterize the extent of the ocean and its relation to the deeper intrerior. Characterize the structure of the ice shell including distribution of subsurface water. Understand geology, composition and evolution of selected targets at local scales. Determine intrinsic magnetic field and its relation to the deep interior. Study the plasma environment, its interaction with Jovian magnetosphere. Determine sinks and sources of the ionosphere and exosphere. Note: In the case of a 2022 launch the cruise phase will be about 7.5 years. JEO will also use a ballistic trajectory with Venus-Earth-Earth gravity assist manoeuvres to reach Jupiter. Jupiter Orbit Insertion (JOI) will mark the start of a 30 month Jovian system tour followed by a 9 month Europa science phase after Orbit Insertion (EOI) in July 2028. The orbiter will ultimately impact the surface of Europa after succumbing to radiation damage or running out of orbit maintenance fuel. Further details can be found at the NASA JEO website. The baseline Mission Operations Centre (MOC) for JGO will be provided by ESA's European Spacecraft Operations Centre (ESOC) and supported by the ESA ground station network (ESTRACK). JGO science operations are planned to be conducted from ESA's European Space Astronomy Centre (ESAC). For JEO, a standard Mission Operations System (MOS) will be developed by NASA's Jet Propulsion Laboratory (JPL), and NASA's Deep Space Network will be used for tracking support. Tracking coverage for both spacecraft will vary according to mission phases. JGO flight operations design will be based on one 8-hour-long track per day during the science phase, but less frequent tracking during the six year cruise phase to Jupiter. For JEO, daily tracking coverage based on one track per day is assumed for all phases of the mission, with the exception of the first 105 days in orbit at Europa, when continuous 24-hour coverage is foreseen.